Traffic jams are a sure way to get anyone frustrated — but luckily for drivers in South Africa this week, some magnificent visitors brought plenty of excitement to make up for the delay. 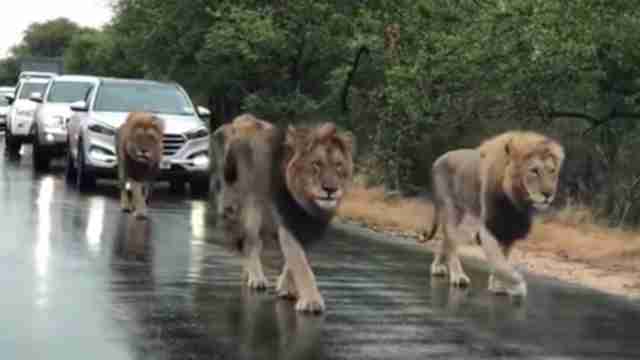 As cars waited on a crowded roadway in Kruger National Park, four huge male lions sauntered down the asphalt in the rain. Drivers were completely unable to move past the big cats — making for quite possibly the most majestic roadblock ever. Luckily, the stunning sight was all caught on camera. While some may assume this is a common thing to see in South Africa, what the drivers were seeing is actually spectacular. These big guys belong to a tight-knit lion pride famous in Kruger known as the Mantimahle males. Likely all brothers, half-brothers and cousins, these lions have a coalition formed to fight off other males competing for the love of lionesses within their territory. In the video, they’re patrolling their land together to make sure no unwelcome visitors come walking through. With the ability to bring this entire road full of vehicles to a halt, this group is surely a force to be reckoned with — and the people who witnessed it will remember it for years to come. Lion numbers are dwindling due to issues like habitat loss and poaching. To help protect lions in the wild, you can make a donation to Panthera.